Fracking Myth Exposed – Again! With companies in the UK (Cuadrilla Resources, Third Energy) getting ready to frack for shale gas, the debate over whether this can be done safely has once again flared up. According to Professor Richard Davies of Newcastle University it is possible to manage and reduce risks, but it is an illusion to believe fracking can ever be completely safe. Courtesy The Conversation. Can fracking be safe? A new study suggests how fracking – the process of extracting oil and gas trapped in rocks deep underground by blasting water into the rock at high pressure – can be conducted without causing earthquakes, which is one of the most well known concerns. While this kind of research can help produce guidelines to reduce the risks associated with fracking, ultimately, it makes no sense to talk of fracking being entirely “safe”. You might as well ask whether you can ensure your journey to work is safe. There are rules designed to reduce the risks, such as speed limits and the highway code, but there will always be the chance of human error or equipment failure. Venturing onto the roads is an inherently unsafe business. Of course, that doesn’t mean we should never do it. The risks involved in any industrial activity mean that we need to think carefully about how to manage them, rather than trying to claim it is safe or not. Fracking or hydraulic fracturing involves pumping up to 16 Olympic swimming pools’ worth of water, chemical additives and sand into shale rocks lying between 2km and 3km underground. This creates a dense network of small fractures in the rocks, releasing gas or oil that moves into the water stream and is pumped or carried to the surface. Earthquakes can occur when fracking takes place near a geological fault. It’s a bit like how a hovercraft works, by pumping air to produce a cushion so it can slip more easily over the land surface. 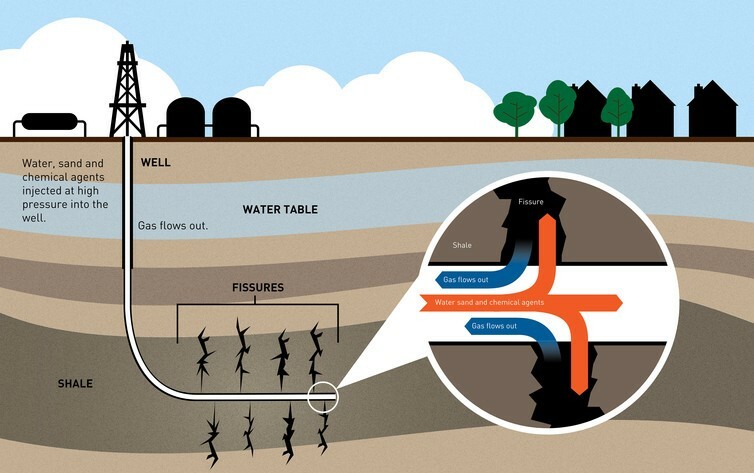 If frack fluid is pumped into a geological fault, it can also slip more easily. Fracking can also change the stress on the fault, causing it to release, and a big enough fault shift will be felt as an earthquake. The new paper, published in Geomechanics and Geophysics for Geo-Energy and Geo-Resources, tries to predict how far from a geological fault it is safe to frack a well without causing an earthquake. Such research is important as it could lead to areas of land being ruled out for fracking, prevent earthquakes and, of course, save the fracking industry from a PR disaster. To make this prediction, the researchers from Keele and Birmingham universities ran 50 models of a fracking operation based loosely on a site in north-west England and modelled the extent of the expected change in underground stresses. They combined this with an estimation of the smallest stress change that geoscientists think could trigger an earthquake. The results show any fracking site needs to be at least 63 metres away laterally from any fault, and perhaps as far as 433 metres. They haven’t estimated by how much this would reduce the chance of an earthquake. Fracking has been going on since the 1950s and on a large commercial scale in the US for the last 15 years, so it might seem surprising that there aren’t already guidelines that cover this kind of risk. But it partly reflects our limited knowledge of the complex underground landscape and how fracking interacts with it. Because of the complexity and variability, a detailed understanding of the geology of what’s below the Earth’s surface is very incomplete. We know the layers of rock beneath the Earth’s surface are extremely complex because we can see this in the rock outcrops at surface level. In the 1970s, exploration firms started to use soundwaves that bounce off underground rock layers to create acoustic images of the subsurface. A borehole can then verify what the images correspond to and the properties of the rock layers. But the resolution of a seismic reflection is low, each at best representing ten metres of rock. This variability and complexity in the rock – and our blurred understanding of it – means that when fracking is carried out for the first time in any location there are uncertainties and risks. How far do the rock layers continue for? What will actually happen to the fracking fluid? Could it travel further than expected into a fault? To try to get answers to these questions, geoscientists carry out experiments in laboratories, build computer models and examine empirical evidence from the thousands of fracking operations that have been carried out in the US. But, even then, we cannot be sure of the answers. For example, in 2012 I led a study into how tall fractures become and so how close to the surface they can get. We used thousands of measurements of fractures from the US. An obvious uncertainty is whether the full extent of the fractures was detected using the well-established method of deploying microphones in a nearby well and detecting the cracks as they grow. We found fractures caused by fracking are unlikely to extend beyond 600 metres vertically. This evidence is now the basis for the UK law that prohibits fracking within 1km of the earth’s surface. Similarly, the new research on earthquakes could one day inform a law on where exactly drilling can take place. But all these results are preliminary, using empirical data, modelling and various assumptions. Only by drilling and closely monitoring more wells will we learn whether the science is robust. There are plans for monitoring the first fracking sites in the UK. This will give us data we can use to put more accurate parameters into our models and learn if the existing guidelines are too lax or too conservative. One day we could stream live environmental data from many sites and automatically detect abnormalities, potentially allowing us to spot environmental damage early. The more we learn about fracking, the more we will be able to manage and reduce its risks. The debate around fracking needs to start with some honesty. Very little of our everyday lives are completely “safe”, and fracking is no exception. Professor Richard Davies is a petroleum geologist who started his career in the mining industry of South Africa. After his degree and PhD he worked in the oil and gas sector, spending 8 years in the petroleum industry in Aberdeen, London and Houston with ExxonMobil working on development and exploration projects. This included working one of the UK’s biggest oil field developments in the 1990s in the UK’s North Sea followed by what were in the 1990s the deepest water wells every drilled by a semi-submersible rig, west of Shetlands (UK) and lastly exploration wells drilled 100s of miles offshore of Nigeria. Since 2007, Professor Davies has developed a strong track in record researching the risks associated with oil and gas activities, often because society wanted answers to pressing questions. From 2007 to 2010 he led an international team that showed that the Lusi mud volcano that caused 40,000 Indonesian’s to lose their homes was almost certainly triggered by drilling for gas rather than being a natural disaster. He is now working on the risks associated with fracking within a pan-European consortium ‘ReFINE’ (Researching Fracking in Europe) that he leads (www.refine.org.uk). He is staunchly agnostic about whether or not fracking is a technology that nation states use but adamant that there is a pressing need for more reliable, peer-reviewed research. His role is to remain unbiased and seek to do the best science possible to help inform the public, governments and other decision makers.